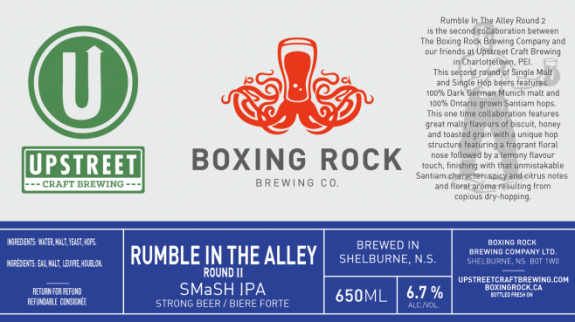 (Shelburne NS) - Rumble In The Alley Round 2 is the second collaboration between the Boxing Rock Brewing Company and Upstreet Craft Brewing of Charlottetown, PEI. 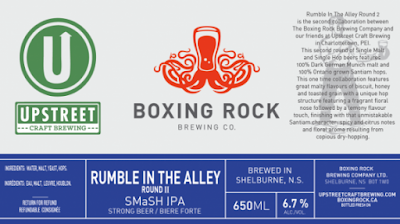 Last year the two breweries made Rumble in the Alley Round 1, a SMaSH IPL made with 100% Maritime 2-Row malt and 100% Amarillo hops. This second round of Single Malt and Single Hop beers features a SMaSH IPA made with 100% Dark German Munich malt and 100% Ontario grown Santiam hops from Clear Valley Hops in Ontario. This beer features great malty flavours of biscuit, honey and toasted grain with a unique hop structure featuring a fragrant floral nose followed by a lemon-lime flavour touch, finishing with that unmistakable Santiam character: spicy and citrus notes and floral aroma resulting from copious dry-hopping. The 6.7% ABV beer is available for a limited time only at select bars in Halifax and Antigonish, as well as in 650 ml bottles at Bishop's Cellar, Rockhead Wine & Beer Market, Harvest Wines, and Cristall Wine Merchants. Also available in 1 litre growlers at the Halifax Seaport Market and the Alderney Farmers' Market on Saturdays from 7:00 AM until 3:00 PM and of course you can also get it at the Brewery retail store in Shelburne.